Would you like a blinding smile? You may be settling for just going blind instead if you routinely whiten your teeth with UV light treatments. 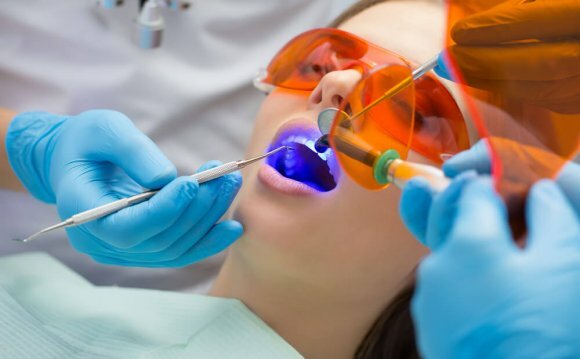 The same ultraviolet light that causes sunburn and skin cancer can damage your gums, lips and eyes during a light-assisted teeth bleaching, a new study finds. The procedure can be dangerous in a dentist office or even in the practiced hands of a mall kiosk worker operating one of these radiation-yielding machines, despite her hour-plus training and her crisp, white lab coat. Numerous studies from the past five years have questioned the practice of any form of light-activated teeth whitening, which is usually a combination of hydrogen peroxide or carbamide peroxide with lights or lasers of various wavelengths. The light is thought to act as a catalyst, quickening the breakdown of the peroxide to create free radicals and accelerating the whitening process. Yet few studies have tested this theory to see what combinations of bleaches and wavelengths work best. A study published last month, in fact, in the Journal of Prosthodontics, found that light-activated and non-light-activated procedures did not differ significantly. Similarly a separate study published in January in Photochemical & Photobiological Sciences also found that light-activation didn't improve bleaching. The researchers went one step further: They found that UV light treatments, in particular, exposed patients to four times the dose of radiation from sunbathing and that the eyes and skin are not sufficiently protected during the procedure. The FDA has received several complaints about burned gums from UV-assisted whitening procedures. In one case a patient with lupus and photosensitivity underwent the treatment not realizing the procedure involved UV. Her lupus symptoms flared up for five months as a result. A dentist can apply high-concentration peroxide to work fast, carefully painting it onto the teeth so as not to burn the gums. Whitening was almost always performed in a dentist's office until about 1990 with the introduction of home kits called "nightguard" or tray bleaching. The home kits have lower-concentration peroxides, and these take longer to get the same result. Entrusting dangerous equipment and chemicals only to medical professionals with at least four years of college and four years of medical school under their belt made sense to a lot of people until about five years ago. Then clever entrepreneurs realized they could take advantage of lax laws and set up mall kiosks with bleaching services. In such an arrangement, they provide bleach and light to the customer to apply. This isn't dental cleaning and doesn't fall under the definition of dental care, for which you need a license. If bleaching with light-activation is a hazard in the dentist office, you can imagine the problems of a kiosk sandwiched between the Foot Locker and Smoothie shop. Neither customer nor kiosk-cadet can assess the oral health of the recipient of the bleaching agent. Someone with soft gums or open sores, for example, should not apply peroxide to their teeth. And the light, we have now learned, is simply another hazard but with no benefit.